Days after Hurricane Irma's devastation the National Hurricane Center (NHC) reports that Tropical Storm Maria has been upgraded to a Category 1 hurricane as it heads toward the Caribbean islands. 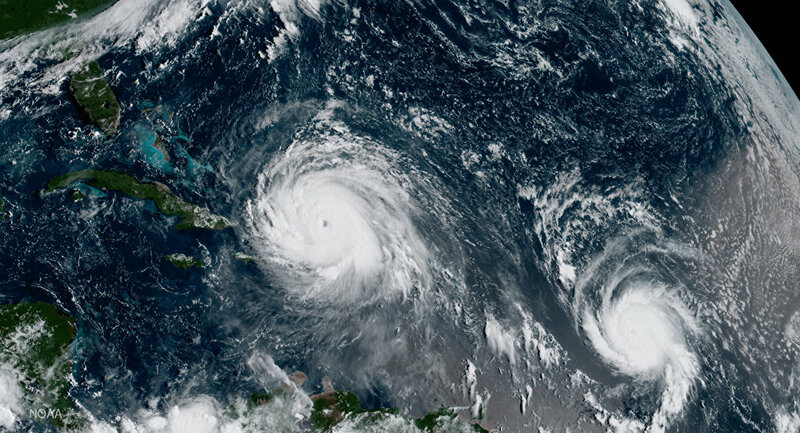 MOSCOW (Sputnik) — The tropical storm Maria, which formed on Saturday in the Atlantic Ocean, has developed into a Category 1 hurricane with the Caribbean islands put on alert, the National Hurricane Center (NHC) said in a statement. "Maria becomes a hurricane… At 5:00 p.m. AST [21:00 GMT], the center of Hurricane Maria was located by an Air Force Reserve reconnaissance aircraft near latitude 13.8 North, longitude 57.5 West. Maria is moving toward the west-northwest near 15 mph (24 km/h)… On the forecast track, the center of Maria will move across the Leeward Islands Monday night and then over the extreme northeastern Caribbean Sea on Tuesday." the statement said on Sunday. According to the NHC, the hurricane's maximum sustained winds are about 75 miles per hour. The hurricane is expected to strengthen within the next 48 hours. "The government of Antigua and Barbuda has issued a Hurricane Warning for St. Kitts, Nevis, and Montserrat. The government of Antigua and Barbuda has issued a Tropical Storm Warning for Antigua and Barbuda. The Hurricane Watch has been discontinued for these islands. The government of the Netherlands has issued a Tropical Storm Warning for Saba and St. Eustatius," the statement said. Recently, the Caribbean region and the southeast of the United States have been hit by a number of hurricanes. The most recent storm, Hurricane Irma — which left over 80 people dead — is considered to be one of the strongest hurricanes ever recorded in the Atlantic basin.